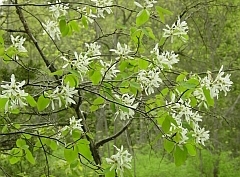 This past December my family and I were clearing honeysuckle out of our locust grove when we found one of our favorite trees: an Amelanchier, or service berry, or June berry, or shad bush, or any number of other common names. 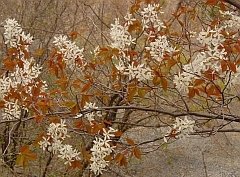 It is a favorite, for its early spring blooming of white flowers, its tasty berries enjoyed by us and the birds in June, its spectacular fall colors of reds, yellows, and oranges and in winter with its stately silvery-grey bark. The honeysuckle bushes were so thick and so large that in our nine years of living here in the valley of West Danby, we'd never seen this particular tree. We cleared out all around it and exposed an approximately 25' tall multi-trunked tree with smooth, silvery-grey bark. 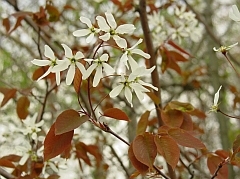 Amelanchier are difficult to identify and pretty much impossible to differentiate in the winter, so I will have to wait until spring for a positive ID, although I can narrow it down to the three tree species: A. intermedia, A. arborea and A. laevis. The only safe rule of thumb is that, at least in this area, if it’s more than 6 inches in diameter, it almost has to be A. laevis. A. intermedia, according to Wiegand and Eames (Flora of the Cayuga Lake Basin, 1926, a very useful reference) forms thickets, and is found in boggy calcareous or non-calcareous soils and is scarce in the Finger Lakes. I'd say our site is dry, and I don't think a tree found in a hedgerow in previously farmed land would have survived in this site if it were scarce. To be certain, I'll examine its leaves come spring. If the leaves are oblong-ovate, acute, tinged with red and hairy when young, we just might have this rare species growing on our woodlot. I'll measure the petals, too, they should be 6-8mm long. The description also says that this is a tall shrub with an alder like habit, a description I don't find very helpful for shadbush, because what I call a 25' tall multi-trunked tree could also be called a tall shrub. That's why I can't rule this species out but I am doubtful it is the correct answer to my question. The other two species are A. arborea (called A. canadensis in Wiegand and Eames) and A. laevis. The main difference between these two is the tomentum or lack thereof on the leaves and inflorescences. A. laevis has glabrous leaves and inflorescences from the beginning, whereas A. arborea has tomentose foliage and inflorescences when young, and hairy petioles. Both have blunt, ovate or obovate leaves.As for habitat, A. arborea is found in dry, exposed hedgerows, ravines and crests, in gravelly or sandy neutral soils and is common throughout the region. The hedgerow part sounds promising, but our soil is not sandy or gravelly; lucky for us it is a most amazingly well drained, sandy loam. We have found only one big rock in all the ditch digging we've done since moving here. A. laevis is reported to be found in damp or dry woodlands and thickets, usually in more acid soils, and is common, especially on the hills of Newfield, Danby and Spencer. Since West Danby is in the middle of these three towns and our soil is slightly acidic, this is the species I'm betting on, but I'll have to wait until spring to know for certain -- I just hope it's not a hybrid!